The idea of a marine aquarium is in itself an elevated choice. Quite varied and complex in nature is one of its two types, reef aquarium. But despite the complexity, if you are able to maintain a reef aquarium well, the final results are simply stunning. 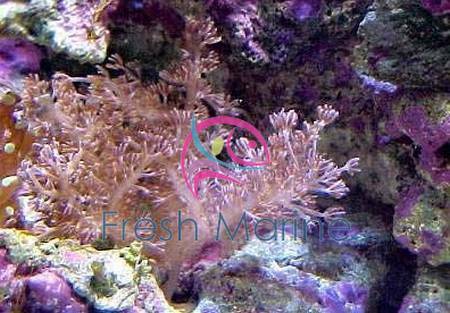 Colt Coral, a Cladiella species, is an ideal candidate for a reef aquarium. Colt Coral is quite simple to maintain without requiring a very high level of expertise. The ensuing discussion gives you an insight about the various aspects of colt coral to help you maintain it in your marine aquarium. Taxonomy: Kingdom: Animalia, Phylum: Cnidaria, Group: Coral, Class: Anthozoa, Order: Alcyonacea, Family: Alcyoniidae, Genus: Cladiella. Other names: While the scientific name being Cladiella species, Colt Coral is commonly known as Blushing Coral and Colt Soft Coral. Origin or natural range: Colt Coral originates from tropical Pacific Ocean, Indian Ocean and the Red Sea. Size: As compared to the other marine invertebrates, Colt Coral is bigger than the moderate sized ones. Color: Colt Coral is found in many dull colors and can add considerable display value to your marine aquarium. Common colors of the Cladiella species are grayish, brown, tan or pinkish in some cases. Morphology: Colt Coral is quite rugged as compared to the other soft corals. The Cladiella species has a branched body structure that closely resembles a tree. Some branches of Colt coral grow thinner and feathery while, the other branches become bushy. The tips of the branches have polyps. Compatibility: Colt Coral is quite non-aggressive in comparison to the other marine invertebrates. Breeding: As the Colt Coral is quite hardy, it is a good option for the beginner hobbyists. Those wishing to propagate coral in their marine aquarium may also go for Colt Coral as it is easier to breed as compared to other corals. If your marine aquarium is able to provide the required environment to Colt Coral then, the coral will divide to yield new Colt Corals. Its better to divide the Colt Coral at the angle of one of its branches and the fragmented piece will grow into a new Colt Coral. On its first division, take care to softly attach the affected portion of Colt Coral to a hard anchor. This affected portion should be exposed to the water current so that it heals fast. Once healed, the Colt Coral will attach itself to the hard surface and is then can be permanently settled at a place into your marine aquarium. Temperature: 72 to 78 degrees Fahrenheit or 23 to 26 degrees Celsius. Water flow in the aquarium: Moderate water flow in your marine aquarium is ideal for Colt Coral considering its need to clean off the mucous secretion from its body. Marine aquarium habit & habitat: Colt Coral secretes mucous to clean its body. The Cladiella species also secretes the mucous if it is disturbed or it senses any kind of threat. Therefore, Colt Coral may also secrete mucous as a defensive mechanism to protect itself. Feeding: Although, Colt Coral is photosynthetic still, it derives nutrients from the very small solid suspensions in the water called as particulates. Direct feeding of the Colt Coral is not advised. As compared to the other corals, maintaining Colt Coral is relatively easy. Definitely avoid keeping a Colt Coral next to aggressive aquarium members so that it does not get disturbed and does not secrete too much mucous for its defense. If this mucous coating remains on the Cladiella species then the Colt Coral may catch infection. To prevent any disturbance and any mucous secretion thereof, don�t keep Colt Coral near to the other corals in your marine aquarium. Rinse your Colt Coral well with saltwater prior to introducing it into your marine aquarium. This rinsing is needed because due to the shipping stress, the Cladiella species secretes mucous and as mentioned above, if the mucous is left on the Colt Coral then the coral may catch infection.